American colleges, universities, and research institutions may provide a good test case of how the challenges of sifting and salvation could play out. IF YOU’VE MOVED RESIDENCE LATELY, much of what you owned may have come to look less like gold and more like rubbish, by the time you finished the task. As your leave-by date loomed, you reasoned that your possessions could hardly all be treasures. In confusion you tossed plenty, and transferred plenty more from tattered boxes into new ones which are now stacked in basements, attics, and public-storage lockers. Audio-visual archivists will recognize the phenomenon. They must ensure that as much as possible of the world’s audio-visual legacy survives, but they are working under deadline pressure: film, video tape, and related media all have limited lifespans. Archivists know that not everything can be saved, or is even worth keeping. But which parts of everything? Given how little is being done to save much, at all, the pessimistic view is that only a small percentage of it is going to make the cut. Joshua Harris surveys some audio-visual holdings during the University of Illinois census. Various kinds of institutions hold audiovisual materials, and virtually none have enough money to meet the challenge. Many have little budget for it, at all. Archivists at American colleges, universities, and research institutions provide a good test case of how the challenges of sifting and salvation might play out. 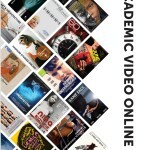 Those institutions – upwards of 3,800 of them — hold a vast amount of audiovisual material that their faculty members have generated in the course of teaching or research. 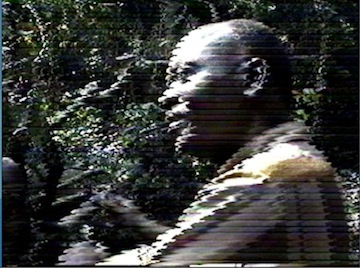 The footage in many cases forms a crucial element of research records. The prospects are not good — at best, not yet good — that much of this hoard of audiovisual material will survive, whether in original forms or through digitization. Archivists know, of course, that only an enormous preservation campaign will make much difference, and they have been trying to impress upon administrators the urgency of the undertaking. But it appears that few administrators have any idea what to do about the looming crisis. And those who do…? They blanch at the prospective cost of preservation, and generally shuffle about behind talk of tight budgets. Do that long enough, and there’ll be little to save. Presidents, provosts, and deans can hardly claim to be too little informed about the issue. Federal authorities and agencies have been ringing the alarm bells for more than 20 years. The National Film Preservation Act of 1988 established a National Film Preservation Board; in 1993 it provided Congress with a report, Film Preservation 1993, which sounded warnings that have built over the years to a consensus: fewer than 20 percent of American silent films survive intact; only half the feature films made in the U.S. before 1950 survive; and many films made since then are threatened by color fading, vinegar syndrome, shrinkage, and soundtrack deterioration. This reel has a fungus problem. It holds a 1959 recording of a symposium at Indiana University of a symposium on the role of the writer in American society, with Norman Mailer and Ralph Ellison in attendance. Priceless. Since, the Library of Congress has pushed an agenda — whatever its prospects, it cannot conceivably have failed to reach the ears of senior administrators of American cultural institutions, colleges and universities among them. The U.S. Library of Congress has repeatedly warned that a crisis is looming in the safeguarding of sound recordings, too. 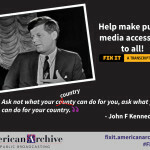 In 2000 Congress passed the National Recording Preservation Act which directed the Library to “plan and coordinate a national effort…” The Library followed its 2010 report — which came with the sobering subtitle, “A National Legacy at Risk in the Digital Age” — with an early-2013 National Recording Preservation Plan which called for greater efforts to preserve the public’s access to audio recordings. The plan, created in cooperation with the archivists, musicians, composers, musicologists, and record-industry reps on its National Recording Preservation Board, mirrored the ongoing efforts in film preservation. 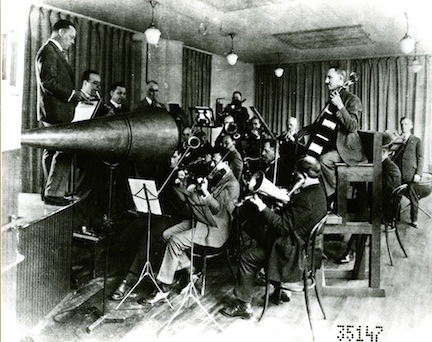 It urged the creation of a national inventory of archival collections of American radio programming, and also called for exploration of wholesale digitization and online access, all with priority for rarities, particularly those on moribund media such as wax cylinders — already only half of the recordings made on that medium survive. The Library of Congress has set up online access to a large number, but small percentage, of the films and sound recordings it wants to see preserved. And it continues to issue dire predictions and cautions. In “The Survival of American Silent Feature Films: 1912-1929,” the first comprehensive survey of American feature films that survived the silent era of motion pictures, which U.S. Librarian of Congress James Billington issued in 2013, he spoke of an “alarming and irretrievable loss.” The survey showed that 70 percent of the 11,000 American silent feature films made between 1912 and 1929 are no longer available in any form, while 86 percent of them are available in their original, optimal formats. The report’s recommendations included working with studios and copyright holders to acquire whatever parts of important films can be found, and to encourage archives and collectors to work together rather than keep films and parts of films away from public access. An acoustical recording session from before the days of microphones: sound passed into recording horns that vibrated a diaphragm and stylus that etched sound waves onto a rotating wax disc. The National Endowment for the Humanities, one of the two largest US granting agencies for cultural programming, has been seeding local projects through its Division of Preservation and Access. It has since 2002 funded Treasures — sets of preserved American films on DVD — through the National Film Preservation Foundation, based in San Francisco. And, through an internship program, it sponsors archival experience for students from the three American graduate-education programs in moving-image archiving and preservation, which are at New York University, the University of Rochester, and (currently being reorganized) the University of California at Los Angeles. 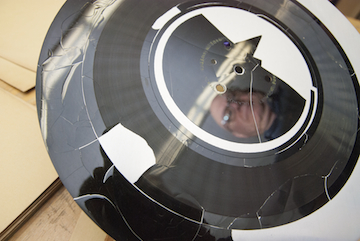 SOUND AND MOVING-IMAGE ARCHIVISTS know when they’re about to encounter decay and destruction. Severe fungus. Breathe out, but don’t breathe in. Joshua S. Harris, the media preservation coordinator for the libraries at the University of Illinois–Urbana/Champaign, is reliving moments of the campus census of audiovisual collections he completed last year. Same deal, when they discovered insect infestations. For months, he and colleagues donned latex gloves and dust masks, and had respirators at the ready, as they hunted every nook and cranny of campus for audiovisual media items and for superannuated machinery that might play them. “We really know this campus, now,” he says. The census turned up 408,000 items in 101 campus units, which stunned Harris: “The diversity of what we found was pretty incredible.” Rare 1920s films. Innumerable audio cassettes and reel-to-reel tapes and videotapes. 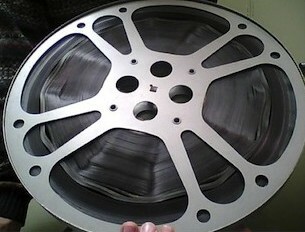 Film that ranged from broadcast quality to home-movie rough-and-readiness. Fighting Illini sports reels. Huge stores of ethnomusicology field recordings. Videotaped animations at a supercomputing center. Audiotapes for speech-recognition research. Film documenting Paul Lauterbur’s work on Magnetic Resonance Imaging, which won him a Nobel Prize. 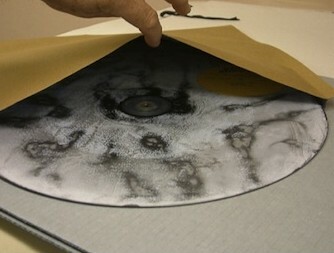 A lacquer disc at Indiana University’s Lilly Library has Orson Welles hosting the Jack Benny show in 1943, but has severe plasticizer exudation, which is common with the format. Sociologist Clark McPhail was not the only emeritus professor with painstakingly indexed and stored collections – his were of 1960’s protests and then later aggregations of humans. He shot the film from ground level, and from rooftops, and fed it all into his soon-prominent studies of crowd formation. The Illinois census took a lead from a pioneering one at Indiana University a few years ago. Indiana’s director of technical services, Mike Casey, who ran the earlier survey, told Josh Harris that he should expect to find AV items in unsuitable storage conditions in buildings abandoned other than as repositories of junk. He’d find them in un-airconditioned closets and under hot-water pipes besides bottles of chemicals. Casey goes to his presentations armed with a battery of statistics, predictions, and dire cautions, for which audio and moving-image archivists do not lack. Compounding the archival and management migraine, he says, is that low-cost computing is exponentially increasing the bulk and burden of what must be painstakingly maintained, even while earlier recordings molder on obsolete audio and video formats. The recordings date from before the “born digital” era, and may be in analog form, or stored on discs and drives in “physical digital” form. In 80 disparate units on the Bloomington, Indiana campus, Mr. Casey and colleagues turned up 600,000 audio, video, and film items on one storage medium or another. They came in 50 formats. At his presentations, Casey tells his audiences that some media are more chemically unstable than others, and will deteriorate more rapidly: for example, lacquer discs, if found with delamination, can never be restored or digitized. The common, everyday audiocassette, much favored in many varieties of research, deteriorates like any analog or physical-digital format (e.g. digital recordings on tape), and once it turns, optimal playback of its contents will be beyond the reach of mitigation and digitization. If an institution is lucky enough to have vintage nitrate film stock, it may be unlucky enough to have it burst into flame, as it will. If jaws have not yet dropped, Mr. Casey can spirit from his archivist’s hat terms like sticky shed syndrome, cylinder efflorescence, curling and shedding, binder breakdown. He can recite a litany of playback machinery and parts that are “unavailable at any price,” that are “down to their last factory run,” that have “ceased to be,” or that are unreparable for lack of tools, parts, and bench expertise. He tells whoever will listen that their institution’s audiovisual research legacy may be buried deep within inappropriate holding facilities, far short of even adequate indexing. “Whenever I give that presentation, there are audible groans,” says Mr. Casey. 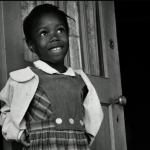 And it’s time for uplift: a tale of archival triumph. 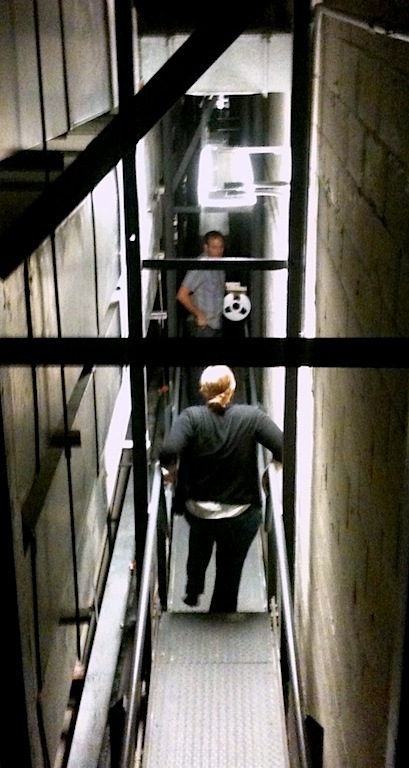 At the University of Illinois, archivists conducting the campus census of audiovisual holdings got to explore every nook and cranny of a vast campus. Here they clamber up to the gods of a performing-arts center. Casey relates that, during their audiovisual census of the Indiana University campus, he and his colleagues heard tantalizing rumors of a cache left somewhere in a campus office building. After much canvassing of its possible locations, he went on a tip to a hot attic accessible only by ladder and found, within, two large stacks of 16-inch lacquer discs, which are infamously fragile. Casey and co. found several hundred more, flung about the attic, apparently by vandals amusing themselves. It turned out that the discs held episodes of The Indiana School of the Sky, a series for K-12 school children that was among the first educational-radio services in the country. The broadcasts took the form of radio dramas that the university began to produce in 1947 on topics like atomic power, evolution, and Greek philosophy. They were acclaimed in their day. And until the find in the attic, only seven episodes had been known to have survived. Casey has other uplifting things to say in his presentations, too, including that media vendors and a few institutions, including the Library of Congress, are stockpiling equipment to expand the obsolescence time frame. Best of all, for his project, is that Indiana administrators are on board. 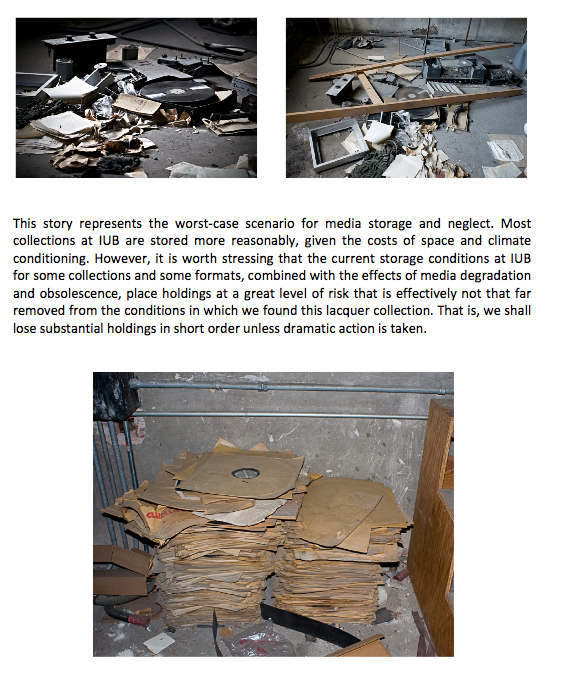 In late 2013, two years after the publication of Casey and colleagues’ report as Meeting the Challenge of Media Preservation: Strategies and Solutions, Indiana’s president, Michael McRobbie, announced a media digitization-and-preservation initiative: he wanted within five years a master plan that would also include still images, manuscripts, and all research collections. 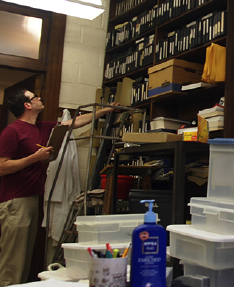 Casey counts himself among the optimists of audiovisual archiving. While many of the techies in that world tussle nonstop about which scientific and technical solutions are the best, or are solutions, at all, Casey has faith that large-scale digitization is a coming possibility, even though it requires expensive vigilance and upkeep. “Know-how and the ability to do it are well-advanced,” he says. 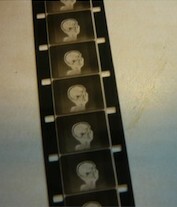 Film demonstrating early MRI technology developed at the University of Illinois was among treasures logged during the institution’s audiovisual census. He says technological promise mounts for arresting and repairing chemical and physical deterioration of film and video stock, too. He observes that, oddly, universities that have dawdled – almost all of them – may end up better off that institutions that began attempting piecemeal and partial efforts 10 and 12 years ago. “Those had to make some unfortunate choices that leave them in a difficult position,” he says. He says now it can be, with sufficient commitment of personnel and funding. “It’s always a question of how you do it and what tools you use. These things get better all the time.” Perhaps 3-D printing will enable rapid, inexpensive manufacture of parts of obsolescent playback equipment. What technological innovations are ahead is hard to predict, but perhaps some will arrest the chemical and physical deterioration of film and video stock, and repair at least some of it. New playback technologies may permit far-more-efficient, automated copying. COPYRIGHT ISSUES NEED TO BE SORTED OUT, TOO, the Library of Congress and many archivists have stated and reiterated. In that 2010 report with the arresting subtitle of “A National Legacy at Risk in the Digital Age,” Librarian of Congress James Billington said many rights holders make listening to their material difficult by restricting access to their facilities, or by releasing little of it commercially. “There is currently no efficient way for researchers or the general public to discover what sound recordings exist and where they can be found.” In many cases, he added, copyright law makes Internet dissemination impossible, even as technologies are emerging that could facilitate it. 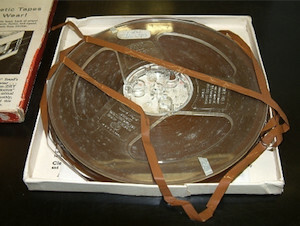 The report, whose main title was “The State of Recorded Sound Preservation in the United States,” boiled down to a cry of “we have to get it together” — we need to produce a national directory of institutional, corporate, and private recorded-sound collections and of any preservation copies in public institutions. We have to remove licensing obstacles to libraries’ and archives’ streaming out-of-print recordings; and we need to set up university degree and continuing education programs in audio archiving and preservation. University archivists constantly stumble over those rights issues, which in some cases would seem to prohibit even restoring recordings, let alone providing access to them. Archivists have to admit that it hardly makes sense for campus administrators to agree to their libraries’ accepting donations of, say, large archives of local television news programming if copyrights aren’t part of the donation (as well as an endowment that supports upkeep of the material). Archives that, say, reveal much about the local region 40 or 50 year ago are at least less worth having if archivists are unable to share them with the public. Collections must be easily accessible, or researchers and students won’t use them; absent public access and enthusiasm, why would administrators approve the considerable start-up and maintenance costs involved in digitization? Gene DeAnna, head of the Library’s Recorded Sound Section, says the problems the report identified are substantial – for example, “pre-1972 and unpublished recordings in particular are a problem because the laws are so confusing.” Both the United States Copyright Office, a department of the Library of Congress, and the House of Representatives Judiciary Committee have held contentious and inconclusive hearings on the copyright issues. 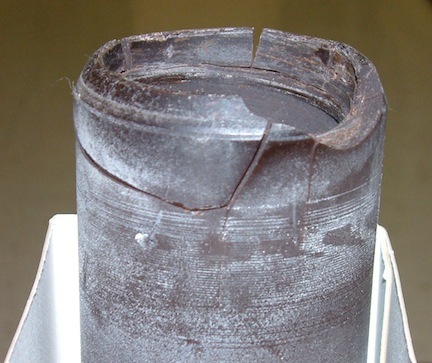 Wax cylinders, an early medium for audio recordings, are decidedly not meant to look anything like this, but often end up this way. The issue knows no national boundaries. One of the key areas for consideration in July 2015 at the annual conference in North Carolina of the International Council on Archives Section on University and Research Institution Archives is how, and how successfully, repositories and scholars are negotiating copyright laws, whether in their own countries or internationally, that are famously muddled. And, have they figured out how to resolve or balance creators’ and producers’ rights, scholarly interest, and public access to collections. No, is the simple answer. Even an outlay of $15-million, Hanson cautions, can do little more than serve only as an institution’s “show of good faith” as it seeks from foundations and donors the far greater amount it needs. A roll of film with severe deterioration from vinegar syndrome, which smells like it says. Even once outside labs perform such work, institutions’ costs do not stop there. 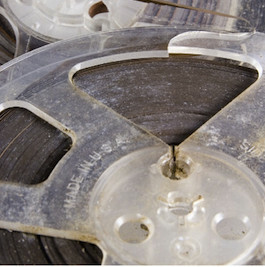 Storing a large amount of audiovisual holdings in original or digitized form may threaten to blow out budgets. Some state, federal, and foundation grants are available for collection preservation and access. 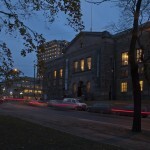 The National Endowment for the Humanities, for example, supports some digitization, cataloging, databasing, conservation, and access, as well as the development of virtual collections, and like other granting agencies smiles most on proposals that include free online access to digitized collections. 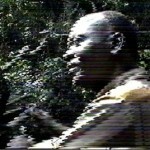 Archivists’ task is to keep footage like this from blurring its message, particularly if the message is enlightenment. But competition for such funding is stiff, which is another way of saying funding sources fall far short of meeting overall need. That is the case on campuses as at museums and other institutions. In the quest for funds, audiovisual collections may there be pipped by collections of furniture, incunabula, early-modern celestial maps, artifacts from a U.S. President’s home, photographs from Mali, or 400-year-old South Asian manuscripts. And of course any one campus’s audiovisual collections must also compete against each other. What is lacking is a concerted approach to an enormous challenge. You have to wonder how much, collectively, we care. The VHS Legacy Can Be Saved, But Will It? Where in the World Must Films Be Preserved?